Try our easy Bread Pudding Recipe. This Bread Pudding Recipes starts with Cuban bread and adds the delectable combination of peaches and cream cheese. Preheat oven to 350°F. Pour milk evenly over bread in large bowl; stir gently. Let stand 5 min. ; set aside. Beat eggs lightly in medium bowl. Add 1/2 cup of the sugar, the raisins, almonds, cinnamon, vanilla and salt; mix until well blended. Pour over bread; mix lightly. Spoon into greased 9-inch square baking pan. Bake 40 to 45 min. or until center is set and edges begin to pull away from sides of pan. Cool. Meanwhile, drain peach slices, reserving 1/4 cup of the juice; set aside. Beat cream cheese with the reserved peach juice, remaining 2 Tbsp. sugar and the nutmeg with wire whisk until well blended. 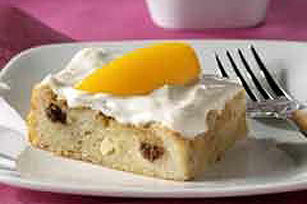 Spread evenly over warm bread pudding; top with peach slices. Serve warm or chilled. Cover and refrigerate leftover bread pudding. Sweets can add enjoyment to a balanced diet, but remember to keep tabs on portion size. Substitute cubed French bread for the Cuban bread. This recipe is perfect for using any day-old bread you might have at home.